Fun fun Fun! 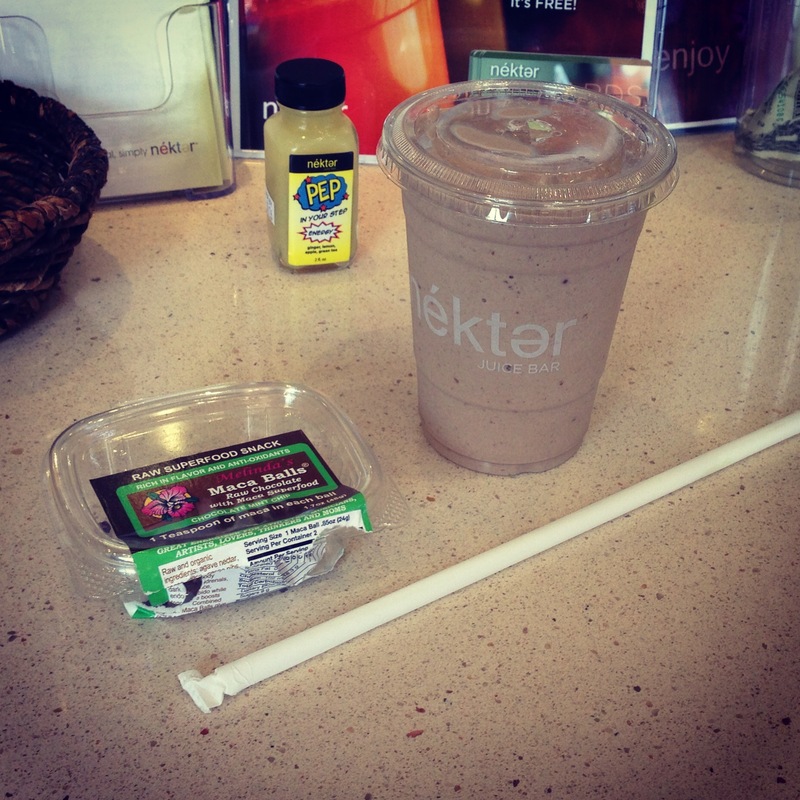 We actually went to the new Néktər Juice Bar in Westwood only hours after opening! We weren’t able to get down there for the actual ribbon cutting ceremony, or the free drinks until 11am, but we were able to enjoy a few treats! This being my first visit to Westwood (yes, I am still an LA newbie!) the one thing I was most uncertain about was the parking. And if *I* am thinking about the parking situation, then you, my readers, will also be wondering about the parking situation as you near the shop. Right on Lindbrook St, and right nextdoor to The Veggie Grill, parking is incredibly convenient. If you’re not lucky enough to find an open street space, there is a public parking structure directly across the street. Super simple. It’s also just a few minutes walk from UCLA, ensuring that this will be a college kid hangout! It’s a great little space, set up like a coffee shop. Walk to the counter, order your juice, and take it to your seat. Most of the seating is actually outside on the sidewalk, but luckily in SoCal we have fantastic weather year round so that’s not an issue at all. Inside, it’s clear you’re in the presence of healthy food choices. It just oozes with happy fruit and veggie vibes. Personal Opinions on Juicing to Follow: Juicing may be a “fad diet” right now, but it has been around as a health choice for at least a century. Some get into juicing for the health benefits, working toward a cleaner, less toxic lifestyle that some claim may actually reduce your risk of and even treat existing cancers. Although the American Cancer Society will tell you that there is no proven scientific evidence that juicing has any effect to treat disease or preventing disease, it goes without saying that no harm can come from drinking more juice, especially if it makes you feel proactive. I got into juicing almost a year ago because I wanted to do right by my body. I learned from my yoga teachers that “my body is my one true possession” and even then I’m only borrowing it – I want to treat it the best I can while it’s in my care. I think it’s really important to note the prices on these juices! A 16oz juice or smoothie is only $4.75. That’s a steal considering a certain natural foods grocery chain is selling their 16oz juice for $7. Sizes here are pretty generous including the 24oz and 32oz big gulps! I don’t know if I could even drink 32oz of juice. Founders, Steve and Alexis Schulze, wanted everything to be made from raw vegan ingredients. That includes the raw cashew milk used in the smoothies. Today we decided to “splurge” on a smoothie instead of a juice. It felt so sinful even though the smoothies are about as healthful as one could get! We tried to chose the sweetest, most decadent offerings possible: Date Nut and Chocolate Dream. 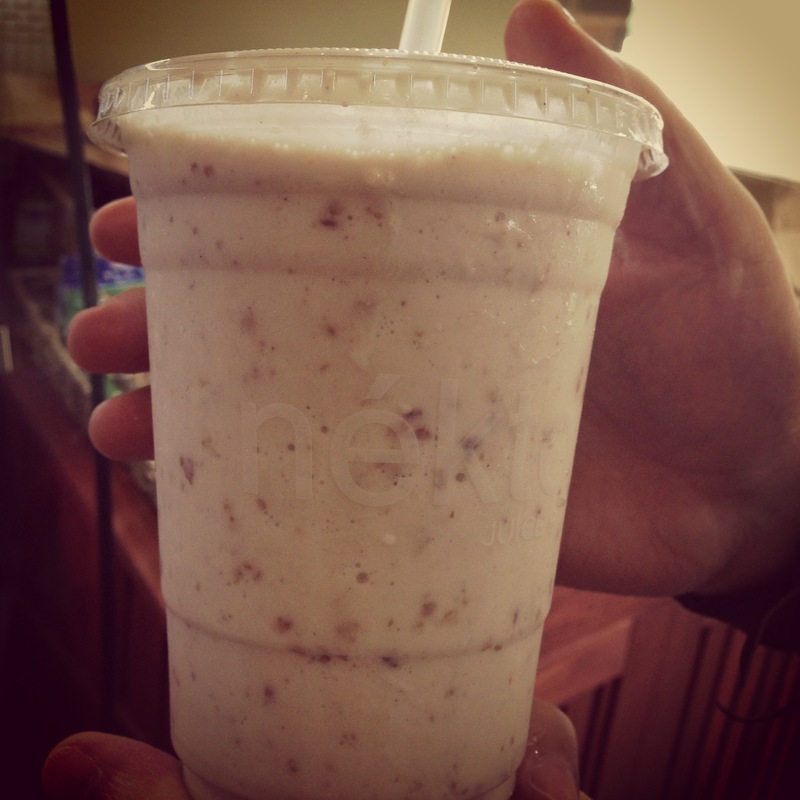 Date Nut: Cashew nut milk, dates, banana and nutmeg blended with ice. Just like the bread – but without the guilt, gluten or gut! Chocolate Dream: Vanilla bean cashew nut milk, cacao, carob, dates, avocado and a little agave nectar blended with ice. It’s the chocolate smoothie you have always dreamed of: healthy and delicious! Which one did we like better? I think it’s a draw! The Date Nut had a gentle Chai vibe going, and considering the dates and bananas, it was not sweet at all. Both smoothies had a nice texture to them, but mine had little cacao nibs floating around, so every once in a while I had a chocolate to chomp on. The Chocolate Dream wasn’t sweet either, again despite the ingredients. The proportions are obviously perfected to make these smoothies both delicious and filling. Felt like we were drinking dessert instead of a healthy meal! We also had the opportunity to try a few of the raw treats in the display case. I had to stick to the chocolate based balls (darn) because the protein balls have whey as their first ingredient. 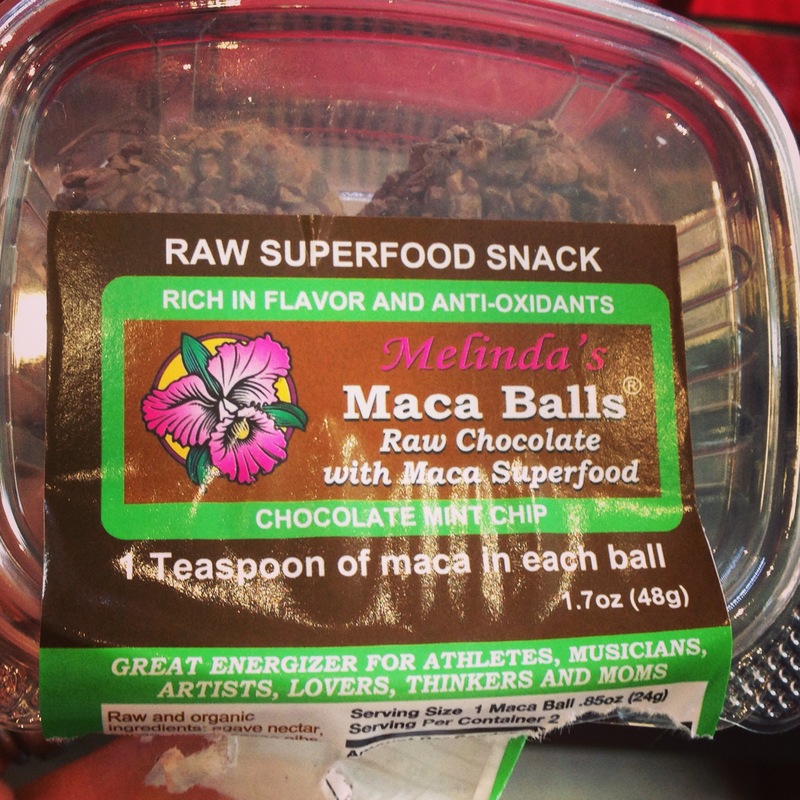 Friand only had one protein raw ball glazed with a little chocolate (“the chocolate makes it go down easier”). I think this was his first exposure to raw treats, so he was amazed at how filling those little treats can be! I enjoyed my chocolate mint balls, and likewise, I could only eat one. Don’t worry, the second wasn’t wasted: I ate it a few hours later when we arrived home. It’s fueling my blogging fingers. There are enough “solid” snacks at the juice bar to satisfy any need to chew. Juice fasts are hard enough, but if you’re juicing for health, it is actually important that you have solid foods, good solids!, in your daily diet. 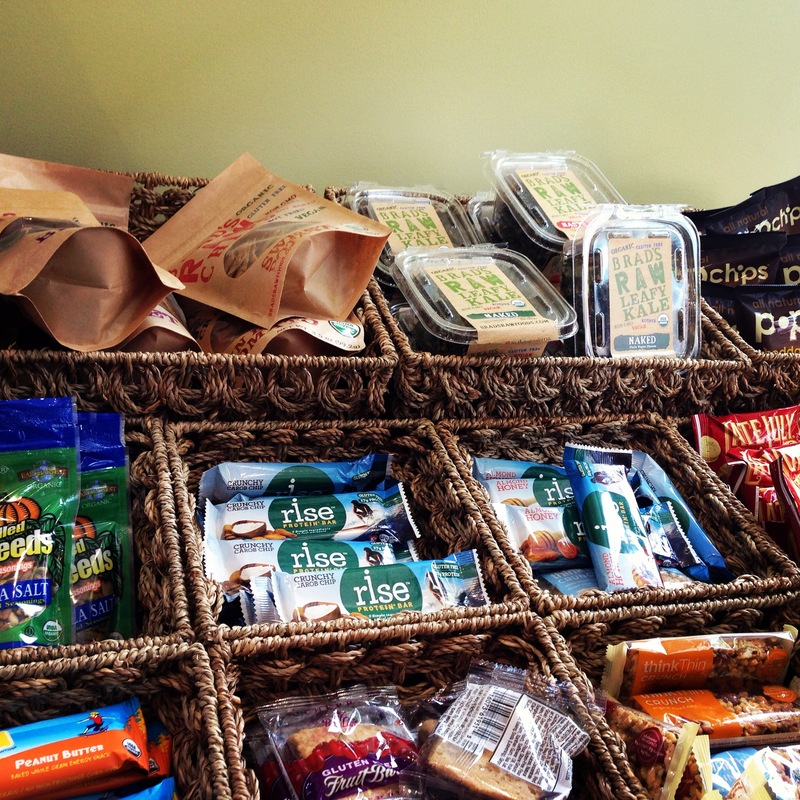 Kale chips and raw, vegan, organic energy bars, nuts, and trail mixes abound! 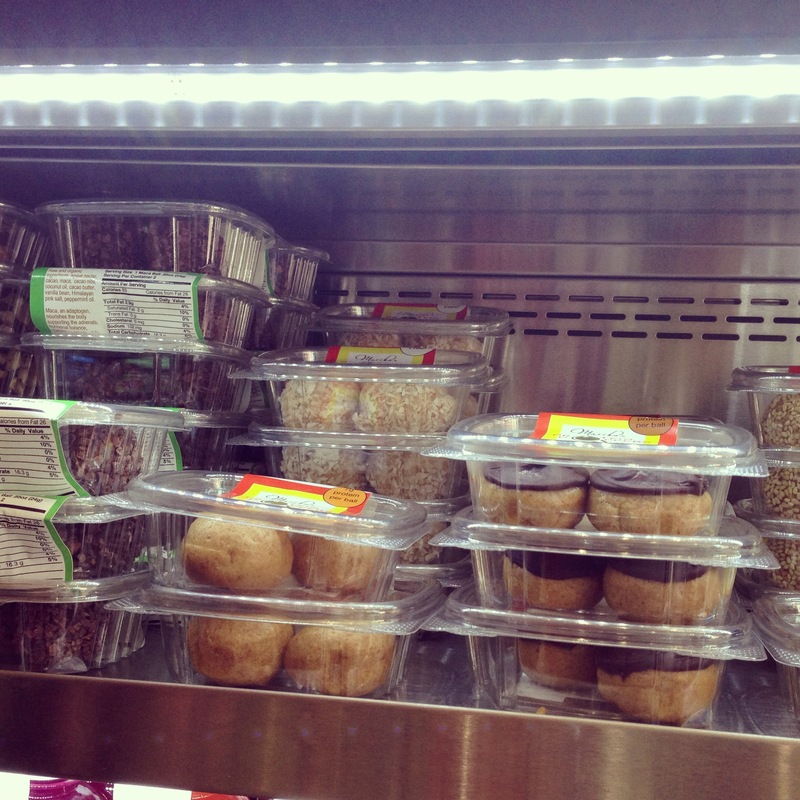 The refrigerator is full of raw vegan energy balls, salads, and quinoa bowls, all in reasonable serving sizes to compliment your juice. One thing we did not get a chance to try today were the Açai Bowls. Also exceptionally priced at $6.75, they promise to be a filling and healthy way to supplement your daily diet. There is also a gluten-free raw oat nut granola option available. And lastly, Néktər offers a prepackaged juice cleanse. You can purchase all the juices you’ll need for a 1, 2, 3 or 5 day cleanse, and again I think the prices make sense. The hardest thing about a juice fast is sticking to it: yes, it is tedious to make all the juice, and if you’re hungry, making the juice becomes a panicky race to get it done. It would be so easy to give up in the middle of preparing a juice just to take a handful of potato chips… but if you have all your juices prepared and waiting for you in the fridge, grabbing your next juice is a no brainer. 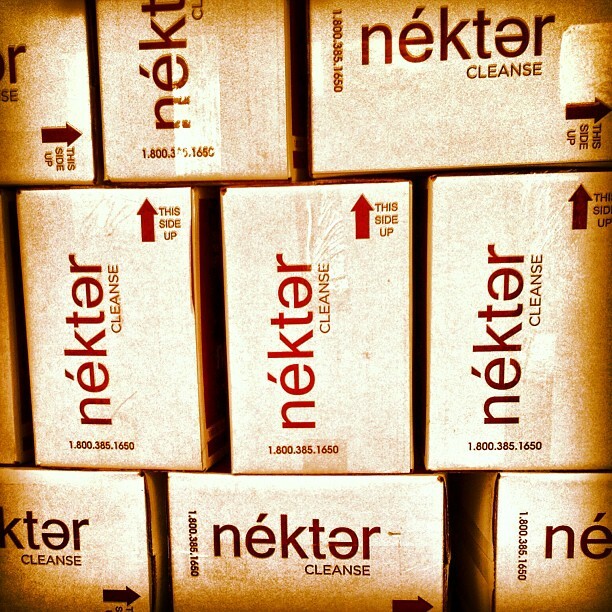 The Néktər Cleanse has 6 juices per day, all labeled so you know in what order to drink them. It takes out all the guesswork. There are plenty of other premade, bottled juices for you to take along. What a great set up these guys have! 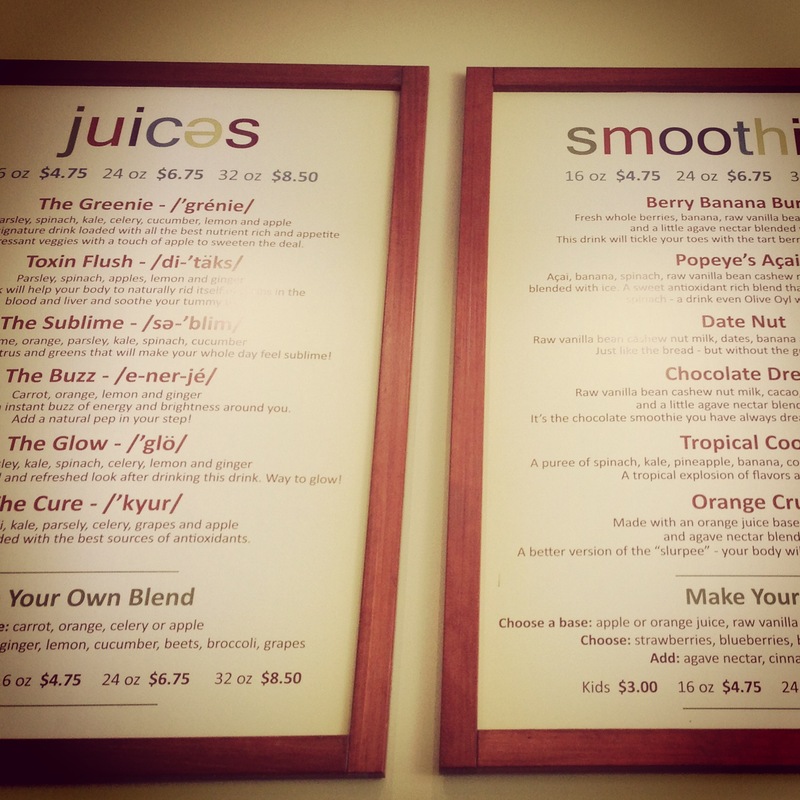 Order a fresh juice and an Açai bowl to eat now, and grab a quinoa salad and a bottle of juice for later. Wonderful! We had a fun afternoon on the sidewalk people watching in Westwood. Many thanks to Kevin, Shaun and Rachel today! Obviously, a raw vegan juice bar gets 5 Sprouts! All the smoothies are non-dairy, so dive in without fear!